Welcome to Aroma Buena Catering. We are a full-service quality San Francisco catering company, local independent and SF HRC Certified, proudly serving you in the San Francisco Bay Area. 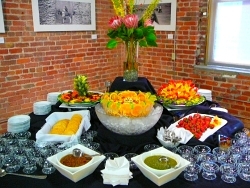 We offer you and your guests a wonderful, unique array of delicious, fresh, authentic, and healthy fare -- for corporate catering, meetings, conferences, classes, company retreats, picnics, special events and occasions, public and private engagements, receptions, celebration of life and memorial observances, social functions, family gatherings, birthdays, anniversaries, and more. - Our celebrated specialty, "Hispano World Cuisine": A choice selection of Spanish, Iberian, Latino, and Caribeno influenced specialties from countries and regions such as Spain, South America including Brazil, the Caribbean, Central America, the Philippines, and Mexican locales such as Oaxaca and Yucatan. When you need a San Francisco caterer, or caterers elsewhere in the San Francisco Bay Area, we look forward to the opportunity to assist you. For inquiries, please feel welcome to call our direct line at 415-305-2856, fax/voicemail at 415-276-4786, or email us at AromaBuena@aol.com.